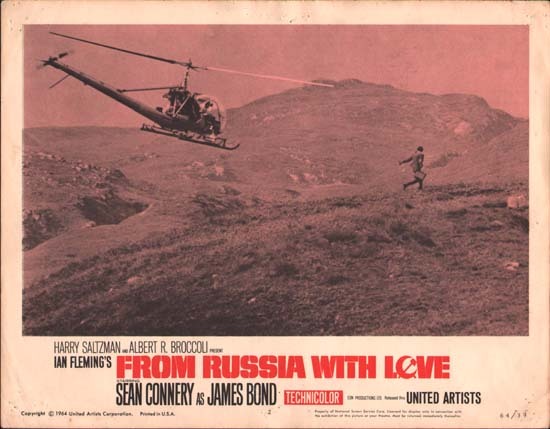 When the gypsy catfight turns into a fiery western gun battle, (complete with flaming arrows,) and ends with James Bond bedding both the gypsy women, I was almost going to bail on From Russia With Love. The second James Bond film fills almost all of the template that would endure for decades, though much of it was already there in Dr. No, the very first outing for 007. In this movie we get a briefcase with all sorts of gadgets in in it, we get some henchmen for the evil genius villain, credits projected onto scantily-clad dancing women, and a pre-credit sequence. This is a complete Bond package. But, oh, how silly the movie gets, and how fast it gets there. Bond doesn’t appear until quite a ways in, as the early sequences are spent with the bad guys. We realize SPECTRE, the organization introduced in Dr. No, is pretty upset with Bond, and it’s personal. They have even recruited the perfect assassin to take him out, an icy killer with tremendous strength and quite a bit of smarts, played by Robert Shaw. Shaw is best known to most movie fans as Quint, the salty sea captain in Jaws. 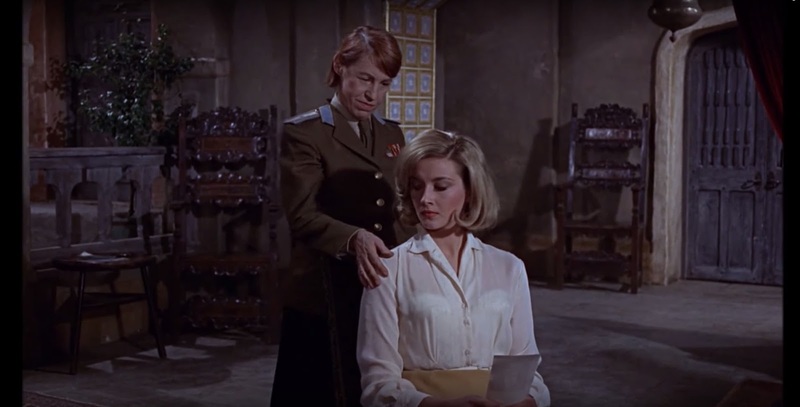 We are also introduced to Shaw’s bosses: Ernest Blofeld (though not called that in this movie) and his Number 3, Agent Rosa Klebb played by Lotte Lenya. These two characters are really hard to take with any seriousness at all, you see they are both specifically spoofed in Mike Meyers’ brilliant parody of the Bond films, Austin Powers, International Man of Mystery. 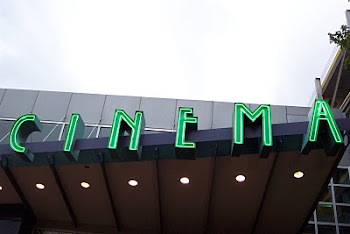 And those performances, by Mike Meyers as Doctor Evil and Mindy Sterling as Frau Farbissina, are indelible to anybody who has watched any of the three films in that series. So it is complete credit to Ms. Lenya that her performance is able to emerge on its own, pulling away from the parody. You feel danger at certain points when she is near, the fact that she is armed with a knife with fast acting poison only intensifies that. I thought, upon her first appearance that I was going to be rolling my eyes throughout, but instead I ended up delighted whenever she would return to the screen. SPECTRE has actually set up a pretty good trap. They will lure 007 into an affair with a beautiful Soviet double agent, who claims to be able to provide a Russian encryption device. The genius of the plan is that SPECTRE is aware that Bond and MI6 will suspect it is a trap, or at least that something is amiss, but they won't be able to resist the possibility of getting this crucial piece of Soviet technology. I really liked this particular wrinkle. It is fun to watch Bond and his superiors trying to work the angles, knowing that they are most likely being set up. 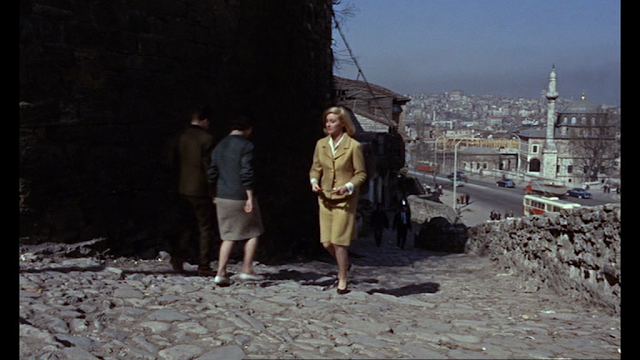 Bond is sent off to Turkey, which is part of what makes this installment distance itself from the original film immediately. Istanbul is a great location. The budget of this second movie is reported to have been double that of Dr. No and it shows. The city looks great, and the designers takes advantage of the locations to build sound stage sets that are interesting and detailed. 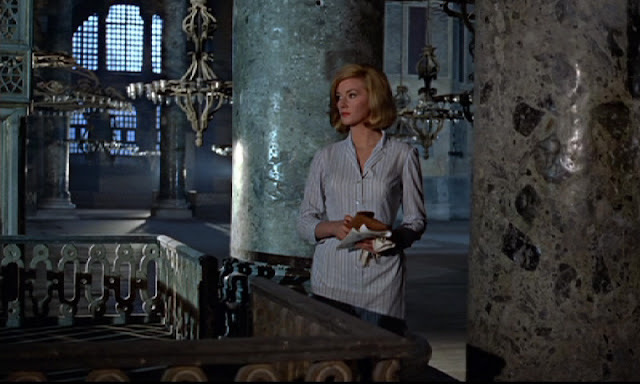 However, the beats are a little similar to what we saw in Dr. No. Bond is followed from the airport, Bond meets his local contact, (a very likable and perfectly mannered performance by Pedro Amendariz,) Bond checks his hotel room for bugging devices, etc. And… next thing we know, we end up at that gypsy encampment, with belly dancers and then the two women in the catfight. These proceedings are interrupted by a weird assault on the camp by squadron of heavily armed men. Soon, the covered wagons are burning and Bond is using a knife to cut the guidewires for flaming tents and using his Walther PPK to pick off enemy soldiers as easily as if he had a sniper rifle. He even saves the gypsy king’s life, and as a reward he gets to bed both the women who were in the catfight. The next morning, they women are best of friends. 007 has brought peace to even these savages. Although it is all in good fun, the movie really underperforms here. How can I say that? Because it gets a lot better, very quickly. 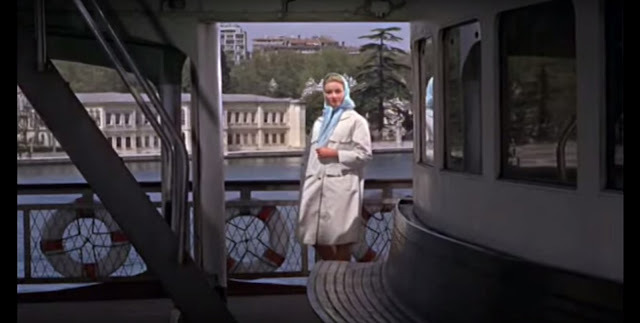 The intrigue that we want from a spy movie begins when Bond meets with Tatiana Romonava (Daniela Bianchi), and the two spend a night together as the sparks instantly fly. This Bond girl is a big step forward character-wise from the almost childlike Honey Ryder (Ursula Andress) in Dr. No. Tatiana is the bait for the trap to get 007 and snag a Soviet encryption machine for SPECTRE, but remember, Bond knows she might be part of a trap. The chemistry between Connery and Bianchi is electric, and so the setup works perfectly. Is Bond falling for her and putting himself in danger? Is she falling for Bond and starting to lead Spectre along? I’m going to say that influence of Alfred Hitchcock starts to be felt very strongly in the rest of the film. Of course, there is the obvious helicopter scene, which is a direct aping of the crop duster sequence in North by Northwest, but I was more engaged by some of the subtler moments. For instance, there is rendezvous on a ferry that makes interesting use of light and shadow, as well as sets up a great segue into an administrative meeting or the head honchos back at MI6. A wordless sequence involving a covert drop off of classified information incorporates the magnificent Haggia Sofia in Istanbul, as well as tracking multiple participants with great skill. During both these sequences, I could easily imagine Hitchcock behind the camera. The adventure even takes Bond on board the Orient Express, and the cat-and-mouse elements there reminded me a lot of train sequences.the master brought us. Things get more action-oriented as the film nears the end. In fact, it keeps giving us climaxes for a good fifteen minutes, eventually ending in a massive explosion. But, unlike the earlier gypsy encampment fight, we are invested so much in Bond and Tatiana’s journey together that the silly action doesn’t bore us. From Russia With Love is often mentioned near the top of James Bond film rankings, and I can understand why. A lot of it feels like a good espionage romance movie. At times if feels like something like Notorious, though its indulgences in the very campiest of 007 tropes keeps it away from that artistic territory.